When Amy Robach agreed to a public mammogram for ABC’s Good Morning America, she did not know she had not one, but three foci of breast cancer to worry about. Amy announced the results of her breast cancer surgery, and it seems she again made a wise and fortuitous decision. Amy elected to undergo bilateral mastectomies and immediate breast reconstruction to treat the breast cancer found on her very first screening mammogram performed shortly after her 40th birthday. As it turns out, this was another fortuitous decision for her and her family. Amy Robach, Host of ABC’s Good Morning American, is a role model for women fighting breast cancer. Amy Robach’s Breast Cancer was treated by a General Surgeon with Bilateral Mastectomies and sentinel lymph node biopsy, and then her breast were reconstructed by a Plastic Surgeon. Since her breast cancer was detected early, it was small, and Immediate Breast Reconstruction could be performed after her mastectomies, during the same operation. Many people don’t know that all Plastic Surgery residents are required to have at least three years of general surgery training prior to beginning their plastic surgery fellowship. These three years must be completed at the same general surgery training program, and a letter of recommendation from the Chairperson of Surgery must be included with every application. These prerequisites help assure the best quality applicants, and eventually the highest quality Board Certified Plastic Surgeons. Rather than completing the three year minimum, I had the privilege of completing a full General Surgery training program, and becoming Board Certified by the American Board of Surgery, an honor I continue to maintain via Maintenance of Certification (MOC) and recertification examinations. While I had vicarious experience with Breast Cancer within my and friends’ families, during surgery training was where I learned the big picture. The book learning and clinical rotations at the University of California, Davis, School of Medicine helped lay the ground work for the disease; however, as a surgery resident I diagnosed, treated and followed up with individual patients. I can remember my chairmen F. William Blaisdell, MD, the father of modern trauma care, and Nathaniel Matolo, MD, stressing the importance physical examination and making the diagnosis of breast cancer. The short version of what they imparted to me is, if you feel a lump in the breast, the only way to be certain of what is there is by looking at it under the microscope. The best single test we have for breast cancer is the Physical Examination of the breasts. Yearly physical examinations and monthly self examinations are still the most important interventions for early detection of breast cancer. Unfortunately, not all breast cancers can be felt. Some are deep within the breast and many breast are firm, fibrous and lumpy enough to make detection more difficult. The next most important screening test is the Mammogram. While it is true that mammograms cause emotional stress, can sometimes be painful and cause many breast biopsies for what turn out to be benign tumors, they have also been shown to statistically increase the early detection of breast cancer and prolong lives. The medical community recommends beginning mammograms at age 40, much as Amy Robach reluctantly did. 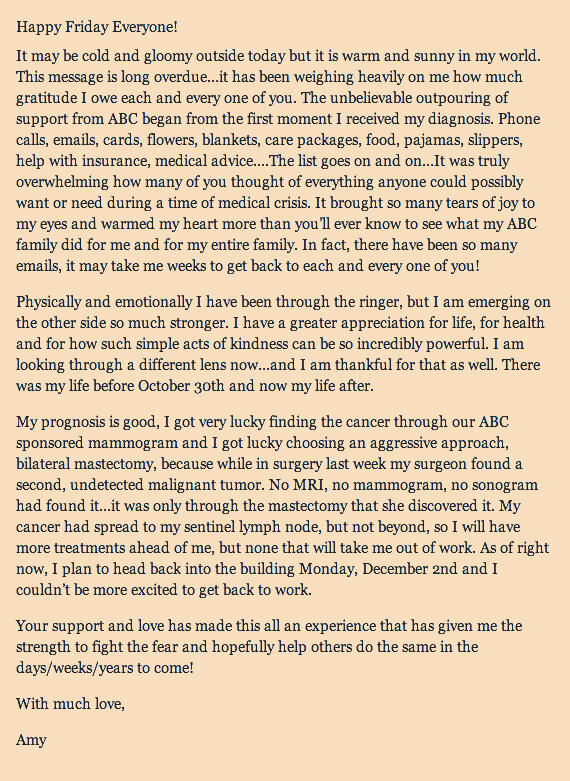 Amy Robach’s Thank-you Letter to her Extended Family. Amy was very fortunate that she had a screening mammogram at age 40. She has no family history of Breast Cancer, nor many Breast Cancer Risk Factors. She was also very smart in weighing the risks and benefits of her available treatment options. She elected to have a mastectomy with sentinel lymph node biopsy to treat her tumor, and to have a prophylactic mastectomy on the other side (preventative removal of the normal breast). While mammograms are good, they are not perfect. Since Amy elected to have bilateral (both sides) mastectomies, all the breast tissue could be examined under the microscope. A second breast cancer was found in the removed breast tissue. This tumor was not seen on mammography, ultrasound or MRI. It is situations like these that make the practice of medicine humbling. It is an art rather than pure science, and there are many exceptions to every good rule. Good medical care is teamwork between patients and doctors. I am a fan of guidelines based on sound science, but realize this is not enough. Listening to and examining a patient provides more information than any test can. Additionally, the combination of a focused medical history and directed physical examination are required to frame the results of every test result. On the other hand, recommendations that limit the options a doctor can provide for their patients should be condemned, especially when the conclusions are not supported by the data. In this case, I am specifically referring to the government panel’s recommendation that screening mammography should begin at age 50. The recommendation is not supported my the data. Another problem with this recommendation, is that the next step will be denial of mammography services by insurance companies, and unless you can afford to pay for you own mammograms, the result will be delayed breast cancer diagnosis, and an increase in breast cancer deaths.